May I introduce my newest addition to the beautiful me plus you Rejuvenate skin care line - the Aromatherapy Radiance Boosting Facial Oil. This is a nourishing and moisturizing aromatherapy facial oil blend containing oils of Camelia, Pomegranate, Marula, Melon and Baobab, which will soften the skin and prevent fine lines and wrinkles. 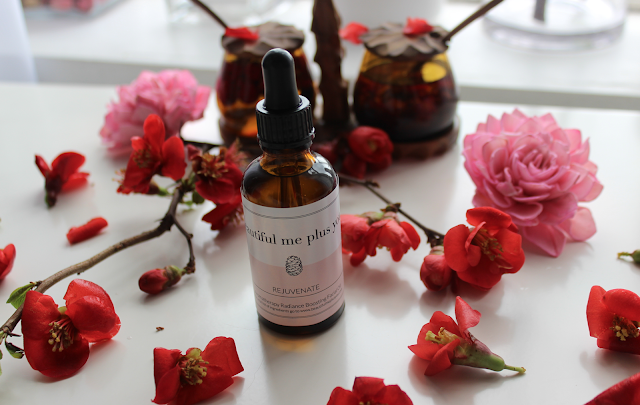 It also contains Rosehip Seed and Cacay Oils that help to support your skin’s cell renewal. This facial oil will tighten pores and refine your skin, as well as keeping your complexion radiant, smooth and soft. The facial oil is rich in antioxidants and vitamins A, C and E which will help to hydrate and tighten skin, making it appear firmer. especially dry skin and mature skin will love this nourishing formula. 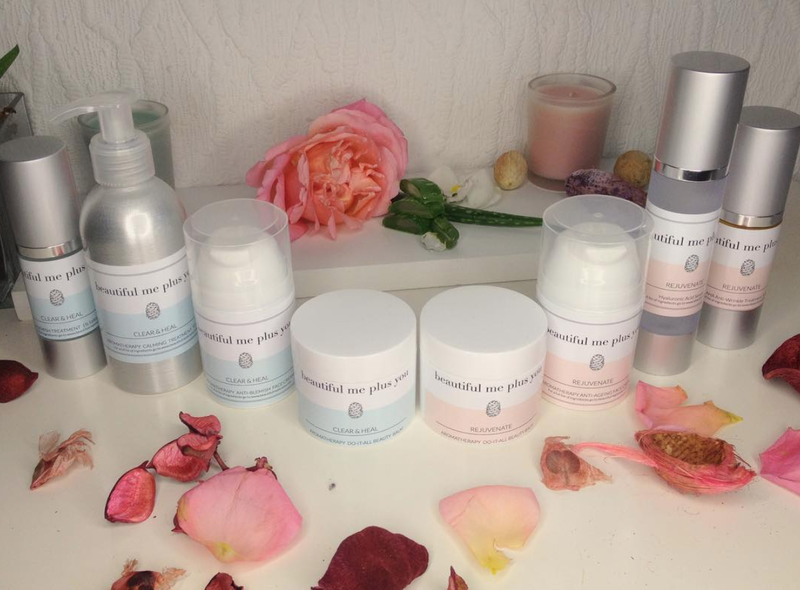 I can also help reducing skin inflammation, such as acne and it can also calm down redness so its also great for sensitive skin. The relaxing blend of rose, sandalwood, vetiver, carrot seed, rock rose and lotus flower will instantly put your mind at ease and will help you fall in to a peaceful night’s sleep. Rose increases positive energy and overall feelings of well being, it imparts sense of peace and serenity, and its both relaxing and uplifting. Vetiver, known as “the oil of tranquility”, imparts a sense of calm and it also enables the skin to retain more water and it also plumps out the tissues of the skin. Sandalwood is a renowned aphrodisiac, its effects are sedative and calming on the mind and at the same time it's also nourishing and moisturizing to the skin. Carrot Seed Oil is a grounding oil and can relieve feelings for stress and its healing properties revitalize blemished skin and nourish dry and mature skin. 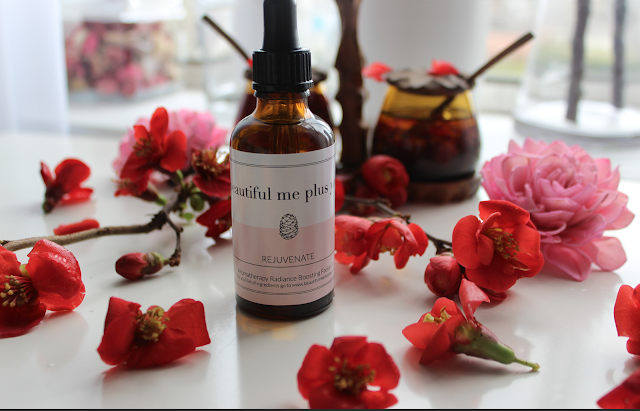 This beauty oil is beneficial for all skin types: sensitive, dry, normal, mature and blemished. Directions: Massage daily, on to face for smoother and younger-looking skin. Ingredients: Camelia Oil, Pomegranate Oil, Marula Oil, Melon Oil, Baobab oil, Rosehip Seed Oil, Cacay Oil, Comfrey Extract, Sandalwood Oil Essential Oil, Rose Absolute Essential Oil, Vetiver Essential Oil, Carrot Seed Essential Oil, Lotus Flower Absolute Essential Oil, Rock Rose Essential Oil.